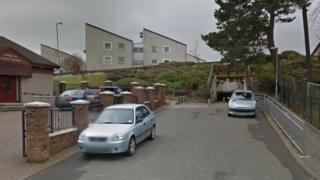 Two men are being sought by detectives investigating the sexual assault of a 22-year-old woman in East Kilbride. The incident happened in the early hours of Saturday 14 October in Whitehills Terrace, near Stroud Road. Police inquiries revealed there were number of people in the area at the time, and they want to talk to anyone who was there between 03:00 and 05:30. They want to trace two men in their early 20s, of skinny build, who were wearing hooded tops with the hood up. The first man was about 6ft tall and wearing a light grey tracksuit top and grey slim-fit tracksuit bottoms. The other was about 5ft 11in tall and was wearing a black Adidas hooded top with a large white Adidas logo on the chest and three white stripes on the sleeves, light blue skinny jeans and black Vans trainers which had a white sole. Det Insp Stevie McMillan said: "A significant number of enquiries have been carried out in order to identify who is responsible for this attack which has left this young woman distraught. "We now know that there were a number of people seen in the area who we are keen to trace. "We understand that there were two men in the area at the time who were in each other's company. "We believe that these men might have important information which could help with our enquiries, therefore I would ask them to come forward to police." He said police would continue to patrol the area to reassure members of the community.